Hope you all had a fab weekend, this girl sure did! And yes, this coat does look a lot similar to this coat, it's actually the very same one but in pink! My girlfriend, Alex, was sweet enough to gift me this gorgeous coat since she received two of the very same one for Christmas- boy does her family know her well- and she knew I had a thing for my darker hued version! I absolutely cannot get over how much I love that bowtie!!!! It's an incredible trademark. Loving the mix of texture! Awesome outfit! Super cute coat, you look fab!! 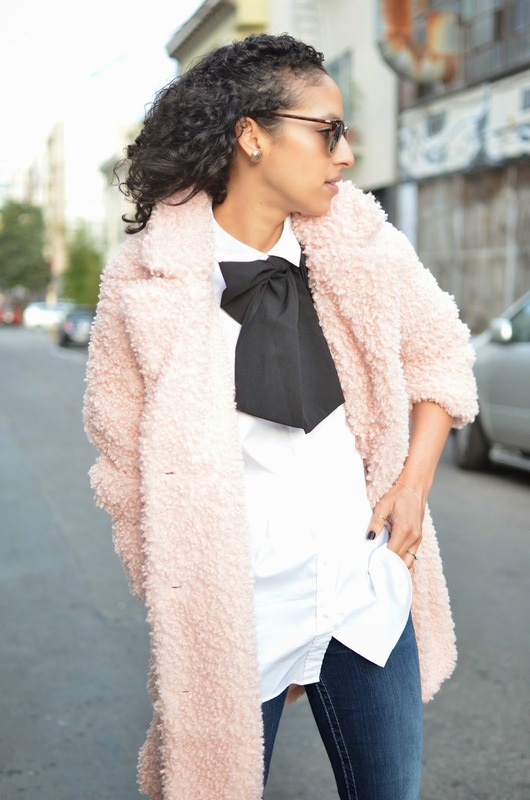 Love the contrast of the classic button down-and-jeans with the fuzzy coat! Great look. I love this coat! It's so much fun. It's like the whole fur coat and skinny jeans concept, just a whole bunch more fun and ethical! That coat is what dreams are made of. Oooh, I love the pattern and the fabric! !